The Infinite. Part 8. Trouble in Paradise. The good, the bad and the peculiar. I’ll begin with the Peculiar, or let’s say, Unsettling, or Cautionary. Cantor allowed that “sets” could be defined by any well-formed logical statement. As it happened, this was not precise enough. And by that I mean, you can describe collections of things by well-formed logical statements which are somehow, too large or strange. A first sign of trouble came from British mathematician and philosopher Bertrand Russell, in the form of a paradox. This is not one of those namby-pamby literary/political/economic/theological/legal things where it seems some assumption or other leads to an outlandish or uncomfortable conclusion. No. This is a genuine fault in the system, FULL STOP. To understand Russell’s paradox, first observe that it is a reasonable thing to consider collections of things which are collections themselves. Like a big warehouse containing smaller warehouses, say. Russell proposed that under a scheme similar to Cantor’s rules for defining sets or collections of things, it is perfectly reasonable to consider “The set of all sets which do not belong to themselves.” The whole idea that a collection might belong to itself seems strange, and indeed it forms the basis of a whole class of arguments related to the existence of a First Cause (the Cosmological Argument – I will say something about this later when we get on to thinking a little about theological questions within and around Mormonism). Russell’s paradox was a road marker suggesting a boundary of reason, or at least precision in language. Another similar paradox is entailed by “the set of all sets.” Obviously, this must be the largest of all sets. But Cantor shows us that its power set is larger (see part 7 for the meaning of power set). Moreover, the set of all sets would contain itself which would contain itself which would contain itself – think sealing room mirrors. This self-reference thing is dangerous. Here's a page from PM. I need to write something for Dialogue like this. These paradoxes motivated several careful theories of Cantor’s universe along with Russell’s attempt to derive all of mathematics from just the bare principles of logic itself. Russell and his partner in the endeavor, Alfred North Whitehead, produced a three volume work, Principia Mathematica (not to be confused in any sense with Isaac Newton’s much earlier work by the same title). The hope was that if all the essentials of mathematics were consequences of the fundamental principles of logic, then the paradoxes would be excluded. It did not do all that they hoped. Mathematics is not contained in logic. The reverse is true, at least in a formal sense. 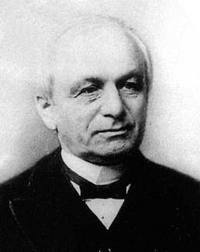 Leopold Kronecker (1823-1891), scion of wealth, he made Cantor depressed. Of course, every Ph.D. student learns that THEIR advisor can do this too. 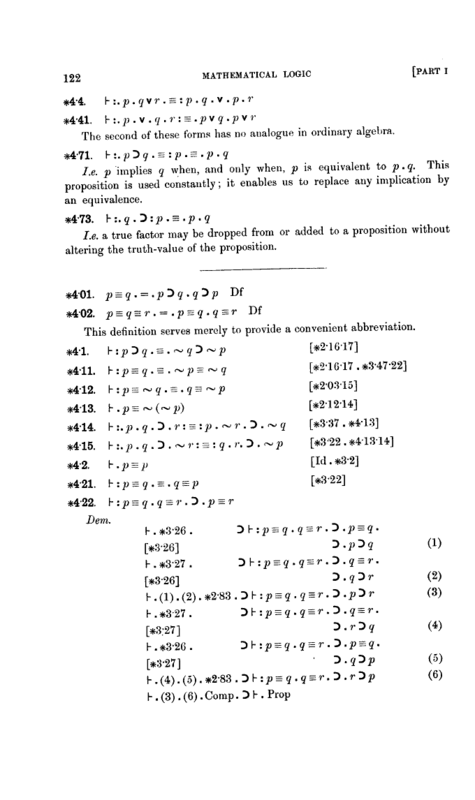 When Cantor introduced his codification of infinity, the opposition was vocal. Some of his friends felt uncomfortable associating with him professionally. His career was stunted and his critics probably cost him a position at Berlin, a large step up from Halle. The irony was in the work of those critics. Some rejected the infinite altogether along with the law of excluded middle. No more reductio ad absurdum. Large parts of mathematics are founded on “existence proofs” and now some saw that whole enterprise as bogus. Men like Leopold Kronecker (Cantor’s Ph.D. advisor) and L. E. J. Brouwer founded a movement called “Intuitionism.” Only “constructive” proofs were allowed and the infinite was confined to at worst, “potential” infinity. Brouwer’s principles may keep some people honest in a way, but in terms of modern mathematics, Intuitionism is more or less a dead religion. Side by side. Russell on the left. 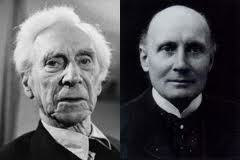 Whitehead was much older and Russell was his student (the photos seem to show the opposite but they aren't cotemporal). Whitehead went to heaven though, whereas Russell . . .
 A Paradox may be good for emotional angst, but it is more than uncomfortable for a logician. If a system allows a paradox it is inconsistent. That means it’s useless for discerning what follows from what. No one wants that. Well, maybe insane people (or economists or film critics) do. The Berry number is the first number, in accordance with the usual ordering of counting numbers, which cannot be defined by means of a sentence containing at most 50 words, all of them taken from our dictionary. This sentence gives a correct definition of the Berry number. But it has only 37 words, all of them from our Post Dictionary. As this sentence constitutes a definition of a counting number (the Berry number) it belongs in the collection R. On the other hand, the Berry number cannot be in R by its very definition. The only way to avoid these very bad situations is to introduce some kind of stratification of meaning for words like “define” or “number.” This was the approach Russell and Whitehead took, but it is tedious and rather unsatisfactory in some way. Another approach was to introduce mathematics as a “formal system.” I won’t discuss that now. I read through a chunk of volume 1 once. It was a little like reading Snorri Sturluson. Russell and Whitehead enjoyed prominence for other reasons too. Somewhat ironically, Russell articulated his reasons for agnosticism (and won a Nobel), while Whitehead founded “process theology.” The latter values “becoming” over “being,” perhaps the child of Principia in a sense. There is no Nobel for mathematics. There are stories that circulate in the mathematical community about why this is. Since most are a bit racy, I won’t repeat them. On Cantor’s universe, we haven’t scratched the surface yet and we need to, so that’s what the next post will do. The modern versions of Intuitionism mostly accept that N exists but they don’t accept Cantor’s Theorem (see part 7). They can do this because they reject the strong form of “excluded middle” we need for Cantor’s Theorem. The principles of Intuitionism were not carefully focused and it was nearly 50 years before it received a formal basis by Stephen Kleene. See Albert Dragalin, Mathematical intuitionism: introduction to proof theory, AMS, 1988 and S. C. Kleene, Introduction to Metamathematics, Van Nostrand, 1952. The best sax is infinite sax. Eternal sax, God’s sax. I don’t think there is sax in heaven. It’s a vacuum. Which is the least contrived of well-known paradoxes? So, after all, there is Sax in heaven, at least according to some thinking. The image captions are my favorite. John, I think the obvious “set of all sets” seems so easy, but so ugly and it illustrates the approach to recovery best: just don’t allow it. “Liar” is an ancient one which partakes of the same soup. “I am lying.” Am I telling the truth, or not? Real things are not paradoxical. Paradox only exists in where there might be intelligence. Same with sets. It is a game with rules that allow paradoxical results. Only intelligence plays these games. Cats are subject to the same universe we are but experience no paradoxes, at least they do not worry about them, apparently. Paradoxes are just a strange part of being human, like warts. RW, you anti-Platonist, you’re banned. I have two cats though. I think one of them may be worried about a paradox. Of course, cats don’t do theology so there’s that. Being human has its points. So when Jesus said he was א and ω (Rev 1:8), was he equating cardinals and ordinals? How counterintuitive! I thought that for finite beings, these are indeed isomorphic, but for the Infinite, this would be a cardinal sin.